There’s no better way to, er, fall into fall than by viewing the colors of the season. (Well, that and football games. And hot apple cider.) You don’t have to trek to the Northeast to satisfy your urge for leaf peeping. We've rounded up a dozen cities and parks across the country that boast eye-popping fall foliage—no Instagram filters necessary! 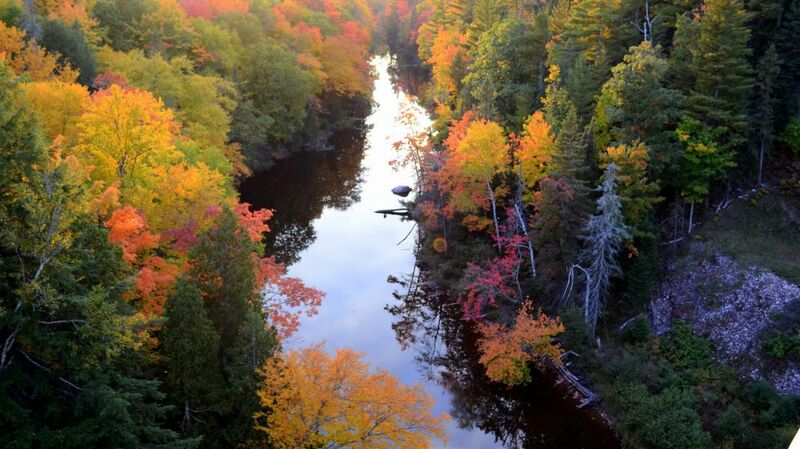 Some seven million acres of forest make the Mitten State’s upper half perfect for fall color viewing. With a spin through Porcupine Mountains Wilderness State Park—along the edge of Lake Superior—you can also catch sight of deer, moose, and black bears. This site’s 47,000-plus acres are so popular with leaf peepers that Maine’s state website offers updates on the current foliage conditions. (The best times are generally late September and early October.) For prime fall color and ocean views, head to the top of Cadillac Mountain—at 1528 feet, it’s the tallest on the North Atlantic seaboard. Hues of gold, orange and red cover this mountainside town from late September through mid-October. You can tour the area by boat, canoe, bike, horseback, gondola, or even dogcart! Double your entertainment by scheduling a visit for the first weekend of October when the city holds its annual Oktoberfest celebration. Nestled in the state’s Adirondack Mountains, this city offers sugar maples, American beech, and yellow birch trees. The best time to go: the second weekend of October during the aptly named two-day Flaming Leaves Festival. In between lawn games and blues bands performances, you can take a chairlift to the top of the nearly 400-foot ski jump for choice views. For top-notch picture snapping, cruise the 105-mile stretch down the park’s Skyline Drive. To ensure an optimal viewing experience, the speed limit is only 35 miles per hour and there are 75 overlooks you can stop at to take in the beauty of the Blue Ridge Mountains. More than 100 species of trees (including scarlet oaks, maples, and hickories) make this spot along the North Carolina border the most visited national park in America. After traversing the 11-mile Cades Cove loop, head over to the popular tourist town of Gatlinburg, which is chock full of breweries, wineries, and even moonshine distilleries. The town is literally named for its abundance of Aspen trees—which turn a golden yellow come mid-September. For stunning views, take a shuttle to Maroon Bells, the two most photographed peaks in the Elk Mountains. You can catch the colors in this New England town by car (drive the 18-mile oceanside Coastal Byway), boat (try a two-and-a-half-hour river cruise) or foot (wander the 10 acres of the Strawbery Banke living history museum). Visit New Hampshire’s foliage tracker to determine when to plan your visit. Hint: aim for mid-October. Every October, the firs, cottonwoods, and twisted pines in this canyon, which cuts through Oregon and Washington, turn golden. Book a room at the charming, antique-style Columbia Gorge Hotel to spy views of the trees—and the 208-foot Wah Gwin Gwin waterfall—from bed. The yellow and orange aspens are the highlight of the 83-mile Enchanted Circle Scenic Byway loop (which surrounds Wheeler Peak, the state’s highest point). But leaf lovers can also catch a glimpse of some reddish cottonwoods. Post-drive, visit 1000-year-old Taos Pueblo and marvel at the remarkable adobe structures. Your best bet to check out the yellow larch and red maples is a 50-mile stretch called Going-to-the-Sun Road. But early snowfalls mean portions of the drive close as early as mid-October. You can also head to Flathead Lake, which offers the opportunity to partake in another local tradition: huckleberry picking! Take a trip back in time when you visit this city on the Wisconsin border. Board a 1890s paddlewheel riverboat and photograph the trees as you cruise the St. Croix River. Then, make vino the old-fashioned way at the September Grape Stomp Festival and crash at one of the town’s many bed-and-breakfasts.